The promised day is upon us! Big Bad Toystore have opened up pre-orders for Sentinel's Classic Mega Man and Mega Man.EXE figures. These 4-inch (10cm) humdingers will run you $39.99 a piece, and they're expected to ship sometime in August. Click the links above if you'd like to pre-order, or just check out some more pics. Remember, this is only the beginning of Sentinel's Mega Man line! There's more to come in the future. Can't wait for the Hub Style variant of the EXE figure! I could of sworn EX Megaman is supposed to be taller than classic Megaman? MegaMan.EXE is the same height as Lan, and Lan is an elementary school student, so he couldn't be TOO much taller than Classic. As if the D-Arts figure of classic Mega Man wasn't already awesome, that classic Mega Man takes it to another level. Do want. God that looks cool. Must convince myself that I am a D-Arts collector... I don't need this... I need this. Pre-ordered MegaMan.EXE, but decided to skip the Classic figure. I still have my Bandai D-Arts one and despite this one looking like it's more articulated, the Bandai one has Rush, a Met, and shot effects. I pre-ordered both yesterday, really excited for these, It'd be really cool to see Sentinel tackle Star Force Mega Man and/or some of his transformations, and some other characters from other MM universes. Hopefully these do well, and Sentinel gets to expand on the line. I don't know if Meagan's buster is correct because it looks a little bit smaller than Rockman 8's animation PSX version. 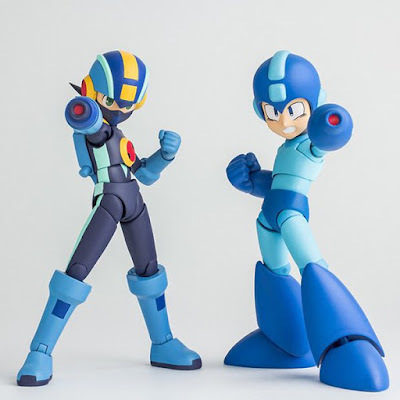 It seems like it might be already, but will these be "Mega Man" branded products, or Rockman? Usually pre-ordering something so soon means Rockman, but I'm not sure this time. So stoked to see .exe ACTUALLY have his "mask" on! I always felt this is when he looks the best!